“Easy to Love…” is Finally Here! 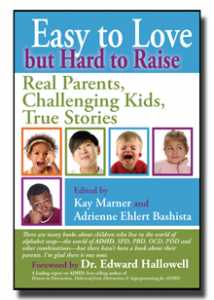 I’m so proud to announce the official release of the anthology that my essay, Finding My Way, appears in, Easy to Love But Hard to Raise: Real Parents, Challenging Kids, True Stories, edited by Kay Marner and Adrienne Ehlert Bashista of DRT Press, and now available in paperback and Kindle. I’m proud to be part of a collection of essays by so many dedicated and wonderful parents who go the extra mile for their children, as well as a few world renowned parenting experts. I hope to do a reading at Village Books in April and will post that info here first. As always, I also continue to post at the blog, Easy to Love, that accompanies the book, which is meant to support parents of children who need more. Thank you to all my friends, family, and supporters! These days, becoming a published non-fiction author is all about platform. Your platform includes all of the activities you do that give you access to your intended audience, such as public speaking engagements, blogs, and media attention. A good platform also increases your credibility as a future author. Christina Katz’ helpful book, Get Known Before the Book Deal: Use Your Personal Strengths to Grow an Author Platform has a wide range of suggestions on how and where to invest your effort and build your own author platform. I’ve expanded my platform recently by publishing articles in regional parenting publications, developing a writer’s workshop that I’ll present this summer, and blogging here and at Easy to Love But Hard to Raise. I recently met an author and film maker with a platform worthy of my envy. Chris Morgan is a scientist, conservationist, and founder of Wildlife Media, a company dedicated to creating natural world films to fund conservation. I attended Chris’ reading and book signing for his new book, Bears of the Last Frontier: The Adventure of a Lifetime among Alaska’s Black, Grizzly, and Polar Bears, at Village Books in Bellingham. The book is breathtaking with pictures and journal entries about his close contact with a variety of bears. During his presentation I was delighted to discover that Chris’ three-part film series, Beartrek: Bears of the Last Frontier, on PBS’s long-time staple, Nature, began this past Sunday night. I’ve programmed my DVR to catch his up close interaction with many bears within their own habitat. Even if you missed the first episode, I’m sure you’ll still be able to appreciate the next two in the series. Chris is also working on another film due out next year. I’m used to reading about New York and L.A. authors made famous on Oprah or morning television with amazing, diverse platforms that reach a national audience. I think to myself, I can have a solid, respectable platform, but I’ll probably never attain that kind of attention. Chris is the first author with an astonishing platform who also happens to live in my little town. Here in Bellingham, Chris is also working with Conservation Northwest on the North Cascades Grizzly Bear Outreach Project. He has a convenient web site that lists his entire platform in one convenient place. He’s got a blog, a twitter following, a company called Insight Wildlife Management to help others manage their bears, and an eco-tourism company that takes regular schmo’s like me into the wilderness to see bears up close. On paper, I’d expect Chris to be completely exhausted. I’m worn out just looking at all that he’s able to accomplish. But he’s also inspiring me to continue to expand my platform. When I get the chance to interview him for a future article, one of my first questions will be, “How are you able to juggle such a diverse array of projects in addition to spending time with your family?” Chris also has a son. He has certainly earned my admiration and respect and I can’t wait to see what he’ll do next. Getting Your Munchkin to Eat! Do you have as much trouble getting your kids to eat anything besides dessert? Check out my most recent blog post over at Easy to Love But Hard to Raise. Then share your “been there” story.